EA's Godfather series features two weapons bearing the name "Dillinger". 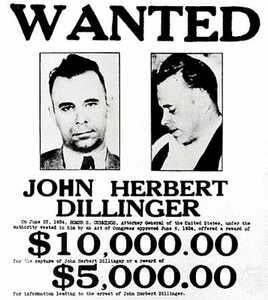 They are, of course, a tip of the hat to bank robber John Dillinger. But the supposed Dillinger estate are having none of it. Jeffery Scalf, who says his grandmother was Dillinger's half sister (I know, I know), has threatened EA with a lawsuit unless they pay him "millions of dollars" for the use of his alleged ancestor's name on the weapons. He's made the threat under the assumption he has control over all aspects of the late Dillinger's estate, including any and all depictions of his likeness and/or name. Best of all, it's not the first time he's tried it; in 2007 he tried to stop a local festival in Arizona from calling itself "Dillinger Days". To protect themselves from Scalf's tactics, EA have filed a request with a judge in San Francisco to dismiss the case, and to grant them permission to use the name "Dillinger" whenever and however they like, claiming the games' status as "works of artistic expression" cover them under the First Amendment.